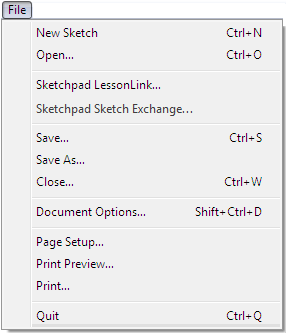 The File menu provides commands for managing your Sketchpad documents. Many of these are standard commands that appear in most software applications. This chapter briefly describes the familiar aspects of these commands and provides more detail on ways in which Sketchpad treats them differently. If you are unfamiliar with any of the basic commands, you’ll probably want to start by looking in the manual that came with your computer.